Aerosmith drummer Joey Kramer will discuss his new memoir during a visit to the Berks campus of Penn State University in Pennsylvania on March 25 at 9 p.m. in the Perkins Student Center auditorium. WFMZ reports admission to the event is free, however, tickets are required. Students, faculty, and staff can reserve tickets now in Room 19 of the Perkins Student Center. Community members can reserve tickets starting March 19 at 10 a.m. by calling 619-396-6076. Community tickets will be held at a "will-call" table in the main lobby of student center. Kramer will autograph copies of his book in the Penn State Berks bookstore after his presentation. 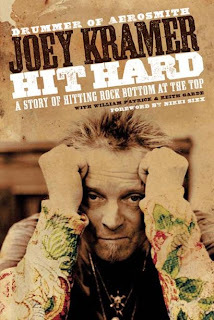 Kramer's autobiography, "Hit Hard: A Story Of Hitting Rock Bottom At The Top", was released on June 30, 2009 through HarperCollins. In the book, Kramer, a founding memberof Aerosmith, courageously tells the world how he has wrestled with depression as part of the most successful rock band in American history. Aerosmith return to the road in support of their latest album, “Music From Another Dimension,” with shows in New Zealand and Australia starting April 24.